During an idle lunch chat at work yesterday somebody said that they enjoyed reading “The Guernsey Literary and Potato Peel Pie Society” book and wondered if the movie would be any good. I looked it up on IMDB and mentioned that the lead actress Jessica Brown Findley was in “Downton Abbey”, and they said that the movie also features Lily James from the same show. As these random conversations go, Lily’s thick eyebrows were mentioned, and that reminded me – of all things – how thick and bushy Leonid Brezhnev’s eyebrows were. So I pulled up image search with his photos on my phone to show what I meant. And as I was idly scrolling his Wikipedia page, I then mentioned how, in the mid ’80s when I was growing up, there were a couple of old guys who were in power for only 12-18 months before passing on. So that brought me to this Wikipedia page to check the exact numbers. And I was shocked. Growing up in the fifteen or so years of USSR, we were obviously exposed to a lot of propaganda. And a lot (and I mean holy cow of a lot) of history of the communist party and its glorious deeds stretching all the way back to 1917. Statues of Lenin were everywhere. Statues of Stalin were everywhere – despite Khrushchev’s campaign to dismantle Stalin’s cult of personality. And despite shallow mentions of repression, purges, forced labor camps and great famine that, collectively, killed over 20 million people between 1935 and 1953 (when he died) – a figure that does not include another 20 million that died during World War II. We were taught that Lenin’s brief time at the top was succeeded by Stalin’s 30 years of power. Followed by about a dozen years of Khrushchev and almost 20 by Brezhnev. 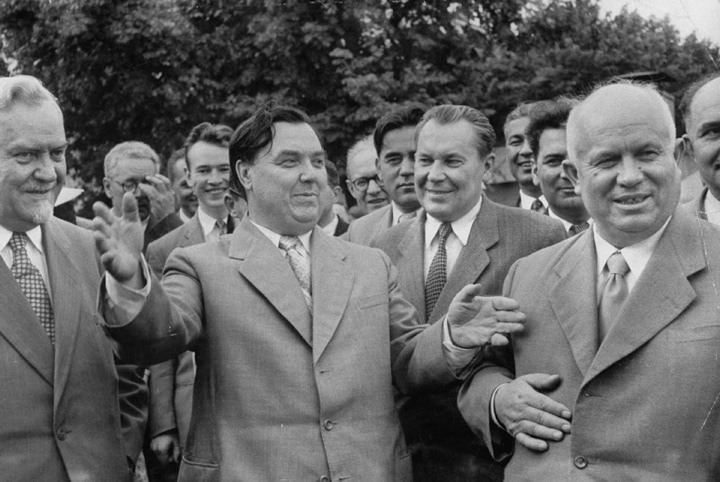 Three towering figures that have ruled the Soviet Union over 60 years. And here was the name that I never heard of – Georgy Malenkov. Right there between Stalin and Khrushchev. His swift ascension through the party ranks as a close associate of Lenin. Eventually becoming Stalin’s right-hand man and second in command in early 1950s. And succeeding Stalin as Premier of the Soviet Union the day after his death. A week later he was forced to resign from the Secretariat by Khrushchev. Following a short political struggle, he was forced out from all top party offices two years later. And in 1957, he launched an unsuccessful attempt at a coup against Khrushchev. He was exiled to his hometown in Kazakhstan. He later was given a two-bedroom apartment in Moscow where he lived quietly, with no political ambitions, until his death in 1988. There were no eulogies on state television. And there was no grand state burial service to honor his achievements. First books about him were published after Soviet Union collapsed in the early 1990s. They say the history is written by the victors. His name was never mentioned in Soviet history books that we read at school in the 1980s. As far as those books were concerned, Khrushchev succeeded Stalin as the leader of the country. There was never that gap of a week – or a couple of years – depending on what political position we’re talking about. It was like Georgy Malenkov never existed. By the time the first books about him were published, I was out of school and Soviet Union did not exist anymore. The whole structure of societal order and market forces that people knew in the last 75 years collapsed. People were forced to adapt to the new world after 3 or 4 generations of living in a state where everything was owned and controlled by the government. Nobody had either time or inclination to go back and revisit the country’s history. Even though, for the first time in generations, the old archives were finally wide open for historians to read about everything that was kept under tight wraps by the party apparatus. It was like Georgy Malenkov never existed.